This morning, my bestie texted me a photo, very casually. She’s texted me hundreds of photos. As a matter of fact, she harasses me regularly to get on snapchat. I refuse. She walked into her dining room and thought to herself, hmmm… my new dining setup looks nice; I’ll text it to my friend. Swipe. Click. Send. She sent it. Thinking nothing of it, I reached over and lifted the phone from its resting place on the mouse pad. (TIP: I recommend cutting an old mouse pad and making it into a phone pad. It keeps the phone safe and stops it from vibrating your ear off if you have vibe alert). There it was. 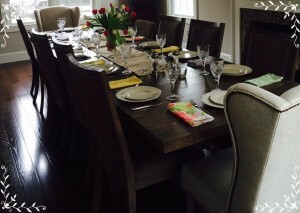 A tiny photo of a big dining table, all set for the holiday feast. I pinched and zoomed, and stared at it. And then it hit me. It’s not just a table. My bestie and I were funny little kids. She was helping raise a little brother and I was an only child with an invisible lion as a best friend. Until our paths crossed. She replaced the lion (not an easy task). Our families didn’t have a lot of money, and I remember being very hungry and wanting a snack but knowing if I asked for one I’d be informed that if I ate it now, there would be none for my lunch at school the next day. I remember having a ticket for a discounted hot lunch. I remember feeling bad about it. So does she. Now, I am staring at the most beautiful, elegant table I have ever seen. It is my friend’s table, and her family will soon be sitting at it and enjoying a perfectly prepared spiral cut ham. There will be plenty to eat, and no one will have to ask if they can have another serving, or if there is enough for everyone. Because, my friend persevered. We both did. She floated around for a couple of years after high school, then set her sights on a four year degree, got it, began a career then pivoted towards another area in her field. She got married, they bought a house, raised a family, and then she and her husband each added fulfilling businesses of their own.